Christmas is a great time for a wedding. Most people are in high spirits and in full on holiday mood, your wedding will make it even more magical for you and for your guests. Christmas decor is set-up everywhere and you can save a lot of effort and money on wedding decorations for the wedding and reception venues alone as they already spruced up for the occasion. There are lots of choices for Christmas wedding bouquets. Thanks to international shipping you have the option for exotic and tropical flowers for a Christmas wedding bouquet. This could be quite costly so if budget is tight, choose seasonal flowers native in your location. Which, to be honest can be quite sparse! Flowers may be hard to find but there will be lots of dark green foliage or leaves, and just think of all the wild berries that would look great in your bouquet. Use a lot of free foliage to bulk up your bouquet. Think ivy, non prickly holly with berries, mistletoe and any other evergreen leaves you can find. Add sprigs with berries, again to bulk up your bouquet but to also add color. 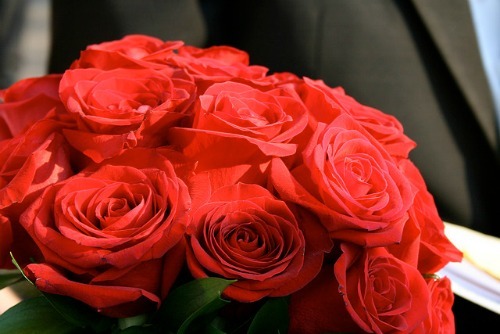 Use cheaper flowers such as gypsum or carnations to fill out a bouquet of roses. Look out for the Christmas silk flower decorations available in most stores. Tie them together with ribbon and you have an instant bouquet. Red and green are the colors of Christmas though you are not limited to these colors. You can opt for white, silver, gold, ice blue and burgundy. Remember to incorporate your wedding colors in your wedding bouquet. 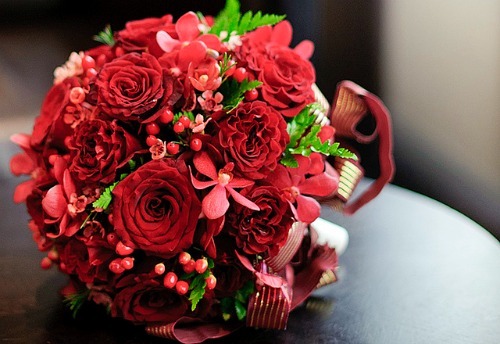 You can never go wrong with red roses for a Christmas wedding. You go for an all-red roses bouquet and then add some holly or ivy for greens. Hand-tied bouquet is simple yet elegant. Bring a red roses hand-tied bouquet together by entwining it with fresh ivy. If you wish your bouquet to be more sophisticated, a cascading red roses arrangement interspersed with mistletoe and Star of Bethlehem. One of the most available red flowers available over the Christmas period is a poinsettia, nothing says Christmas more than this flower and a simple hand tied bouquet would work very well. A great and inexpensive Christmas wedding bouquet is a round arrangement of burgundy rose and red miniature carnations. Add some myrtle and eucalyptus leaves to frame the flowers. The scent should be interesting because of the mix of roses and eucalyptus -the scent of spring and winter in one wedding bouquet. 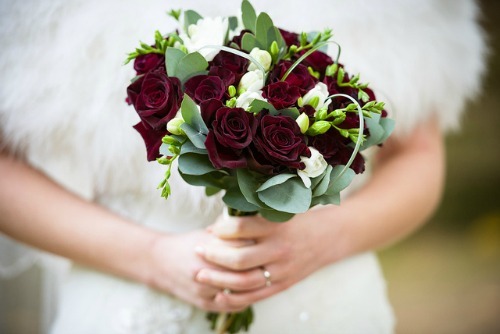 Another inexpensive yet beautiful Christmas wedding bouquet is a combination of standard burgundy roses and red miniature carnations framed by greens of galax and ivy leaves. The contrast of dark red and green is just perfect. The effect is stunningly simple yet elegant. More so it exudes a festive and Christmassy ambiance. If you prefer a red wedding bouquet with some touches of green, a nicecombination is red calla lilies, carnations and roses. For the greens add some elegant cymbidium orchids or to keep the costs down you can opt for ivy leaves cascading from the round bouquet. Calla lilies are also great by themselves and are a real statement, use the red flower by itself with ribbon wrapped around the stem. Don't just think fresh flowers as silk wedding flowers are a great way to get the flowers that you want and then you also know that if the weather is bad you will still have a stunning bouquet safely tucked up at home! The type of arrangement is also important. There are flowers that will look great when arranged in a cascading style and there are flowers that are best arranged as a round or hand-tied bouquet. If you want a slimming effect on your silhouette, a cascading wedding bouquet is a great choice. If your wedding dress is sleeveless, consider an arm wedding bouquet. 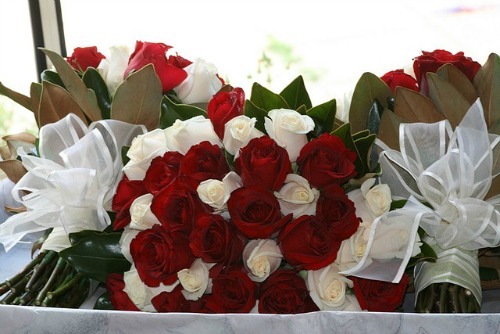 The hand-tied Christmas wedding bouquet is a popular choice for brides now. This type of bouquet has as slimming effect on the bride's silhouette. This bouquet is certainly elegant, simple and so natural-looking. It is as if the flowers have just been picked from a flower garden.